Back to school time is just around the corner and there is no time to waste! The back to school season is one of the busiest shopping times of the summer. This makes it the perfect occasion for promoting with school supplies, such as custom binders, personalized pencils, printed spirit items and so much more. Why not use this time to advertise your company, build your brand, advertise an event or promote an organization? There is wide range of school related promotional products to choose from. Here are a few ideas to get you started. Spirit Items are an excellent way to promote while showing school pride. They are ideal for pep rallies, school sports teams and for building school unity. School pennants are an excellent item for cheering on a team or commemorating a special event. Foam fingers stand out from the crowd and will grab the attention of everyone. They come in a variety of shapes and colors to compliment any logo. Wholesale Pom Poms are sensational for cheering squads and party favors and are available in your favorite colors. You can’t go wrong with school spirit products. Personalized calculators are another excellent back to school item that will multiply your promotional success. They are available in many styles, including solar powered, pocket, desktop, ergonomic and even biodegradable. Custom calculators are perfect for gaining repeat exposure for your logo or slogan. Add printed calculators to your back to school equation today! Custom binders are perfect for back to school promotions because they help you stay organized and make it easy to promote in style. Custom plastic binders are affordable, long lasting and effective for educational programs, fundraisers and school promotions. PrintGlobe carries personalized binders in a variety of colors, styles and sizes. Simply add your logo, slogan, or artwork and you are ready to advertise! Custom pens and personalized pencils are a popular and effective way to promote throughout the school year. 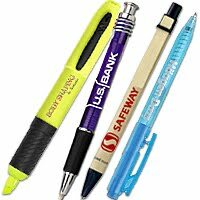 There are endless selections of pens, pencils, markers and highlighters to add your logo to. Custom imprinted pens are available in styles and prices to fit any budget. Choose from retractable pens, eco-friendly pens, stick pens, light up pens and more. If you are looking to brighten things up, wholesale highlighters may be what you are looking for. They are perfect for any school related promotions. Mechanical pencils are great for stocking office supply cabinets and for handing out at school. Their durable and reusable design makes them perfect for advertising your logo. What are you waiting for? Get your back to school campaigns rolling today and make this school year a year to remember!